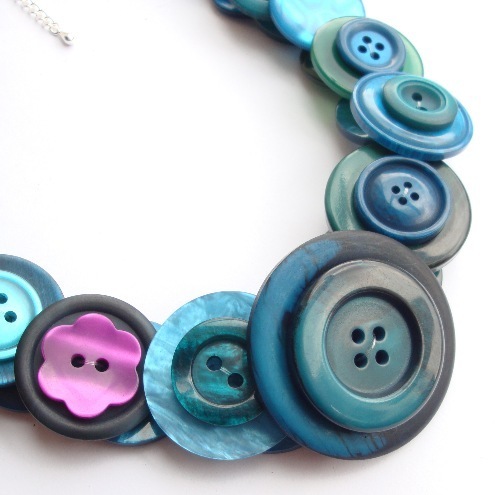 Folksy :: Buy "Large Button Necklace- Peacock (Free UK Shipping) "
This necklace is made from a selection of blue, purple and green toned buttons. It is finished with a silver plated clasp and extension chain to allow you to alter the length to your needs. Folksy :: Buy "Wire wrapped bracelet - Turquoise (Free UK Shipping) "
Folksy :: Buy "Small Button Necklace - Nautical (Free UK Shipping)"
Folksy :: Buy "Large Button Necklace - Blue (Free UK Shipping)"